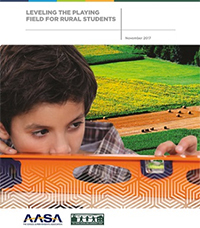 Limited access to advanced coursework, medical care, food and employment opportunities continue to daunt students in many rural communities, according to a report released today by AASA, The School Superintendents Association, and The Rural School and Community Trust. This report reviews high school dropout rates and related factors in rural high schools throughout 15 Southern and Southwestern states. These schools are in districts that are among the 800 rural districts with the highest student poverty rate nationally. Seventy-seven percent of the "Rural 800" districts and 87 percent of the students in them are in these fifteen targeted states.